Who doesn’t love nice furniture? If you’re a pet parent, though, you may opt for less expensive pieces out of fear that your dogs (or cats) will ruin them. Before you give up your dream of a Pinterest-worthy home, know this: You can combine style with pet friendliness. Here are five tips to help you do exactly that. When shopping for furniture, avoid microsuede and velvet that will attract pet hair and transfer it to clothing. Go for durable fabrics such as thick canvas, Crypton, or sturdy leather. Another option is to buy outdoor furniture—if it’s strong enough to withstand weather, it can handle your pets. Small-scale patterns leave only little blocks of color exposed, meaning that they’re great at hiding dog hair and stains. Don’t like patterns? Then match the color of your solid upholstery furniture and accessories to your pet’s coat—black dogs and white rugs don’t mix well. Beagle on couch by Shutterstock. If a brand-new couch isn’t in the budget, give new life to an old one with a washable slipcover. That way, if your dog makes a mess, it’s easy to clean up. Get one that fits your sofa, as opposed to draping it, for the neatest look. If your dog likes to chew wood, pick up one of the many sprays at your local pet store that act as a deterrent—Grannick’s Bitter Apple Spray is one non-toxic option that works well. Pro tip: Leave the area after application to allow it to settle, or the solution can get into your mouth. If your dog sleeps with you, opt for bedding that will stand up to weekly washings. You also may want to add a more durable mattress pad (like the Therapedic Waterproof Mattress Pad we gave away last year), which will protect your bed from accidents. Live with lint rollers in reach—Keeping lint rollers and a handheld vacuum helps with quick cleanups. Pick the right paint—Opt for semi-gloss, as it’s easy to wipe away dog drool and other stains. Lock it up—If you’ve got a curious dog who likes to get into cabinets, add locks. About the author: Alyssa Alimurung is community manager for CityRealty. When not posting about NYC apartments, she enjoys yoga, ceramics, and bouldering. 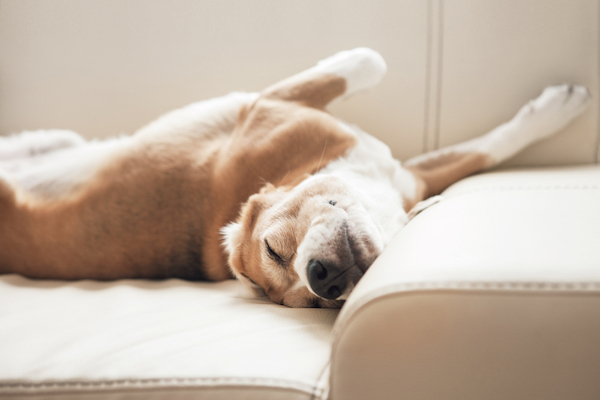 The post 5 Tips for Buying Dog-Friendly Furniture and Accessories appeared first on Dogster.